In the week it takes for a politician’s wife to plan a dinner party, the evolving lives of seven controversial characters (ranging from an islamic extremist to a hedge fund manager) intertwine to form a metaphoric evaluation of London circa 2007. Sadly, a lack of character development and intruiging plot lines leave nothing but an uninteresting run through the week of characters who are impossible to relate to. The brash and gaudy references to media phenomenon and industry giants leave a bitter taste of an author with an axe to grind that overcomes the satyrical insightfulness that was surely intended. Urgh I did not enjoy this book. It was like some kind of modern everyman tale but I only had any sympathy for one or two of the characters. I hated most of them. 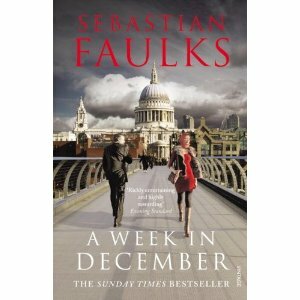 You are currently reading A Week in December by Sebastian Faulks Review at booksbeccabuys.